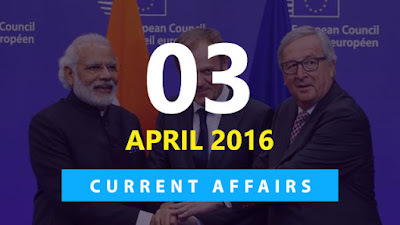 Hi Aspirants, here is the Online latest Current affairs Quiz for 3 April 2016. These questions will be very useful for all upcoming exams like SSC CGL 2016, Railway RRB 2016, ISRO Assistant, PSC University Assistant & other bank exams. Attmpt the quiz to check the right answers. 1) Which e-commerce giant has recently acquired a Bengaluru-based mobile payments company PhonePe? 2) India has recently signed a memorandum of Understanding (MoU) with which country for setting up Laser Interferometer Gravitational-wave Observatory (LIGO) in India? 3) Fourth edition of Nuclear Security Summit (NSS) was held during the first of April 2016 at? 4) Which country has recently (April 2016) elected Nguyen Thi Kim Ngan as the country`s first female house speaker? 5) World Autism Awareness Day was observed across the world on? 6) Union Government on 31 March 2016 launched Vidyut PRAVAH Mobile App to empower People to demand 24x7 ___? 7) 13th India-European Union Summit was held on 30 March 2016 in Brussels. Brussels is the capital of? 8) Prime Minister Narendra Modi and Belgian Prime Minister Charles Michel on 30 March 2016 remotely launched Asia's biggest telescope, the Aryabhatta Research Institute of Observational Sciences (ARIES) which is located at Devasthal near Nainital in which state? 9) Which state recently launched Project Salamati for injectable contraceptive? 10) Which country on 30 March 2016 launched its 22nd satellite for its BeiDou Navigation Satellite System (BDS)?